Today I had the pleasure of speaking at the Conservative Womens Regional Conference at the Kensington Chelsea and Fulham Conservatives HQ. The theme was "A Time for Change and New Technology". It was an honour to be asked. Given that it has been quite a long time since I have presented to an audience, and the star quality of the other speakers (Nadine Dorries MP and Iain Dale), it was a slightly daunting prospect. But it gave me a great opportunity to unleash something I have been thinking about and conceptualising for quite some time. 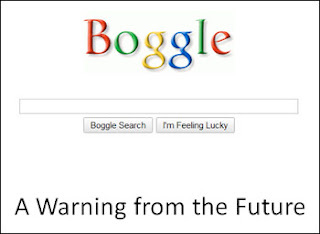 Boggle is a construct - it's an imaginary Google of the future. As you can see, it looks as innocuously simple as Google does today. But like Google's simplicity, it conceals an awesome power - only truly, vastly more so because Boggle is the interface of the future.. My presentation explained this extraordinary power and how its inevitable consequences will impact on our lives and on some of the key philosophical and political questions of our time. The results were startling. There was no doubt that my presentation was a huge eye-opener for the audience. It both shocked and awed to an extent I hadn't predicted. We explored complex technologies such as for example; voice recognition, voice-stress analysis, visual image recognition and others and my task was to simplify and explain how the technology works, how it can be used and the difference it will make to our lives and our world. The challenge of presenting complex technology to a group of ladies, some of whom barely use a computer, was significant. But they all really got it. It was tremendously satisfying. There was one particular lady in the audience who came up to me afterwards and explained that she had worked in the defence and technology industries after the war and was partly responsible for developments such as advanced radar and fibre-optics. 'We knew this would happen. Even back then.' she said.